A question-and-answer session with the Polgar Family, and a bonus lecture by Susan on chess principles, tactics and combinations. The EU Youth Talents vs Judit Polgar simul , the world’s N°1 female chess player, as an ambassador of Chess in School program adopted by the European Parliament, gave a 27 board simul to children representing the 27 nations of the EU. 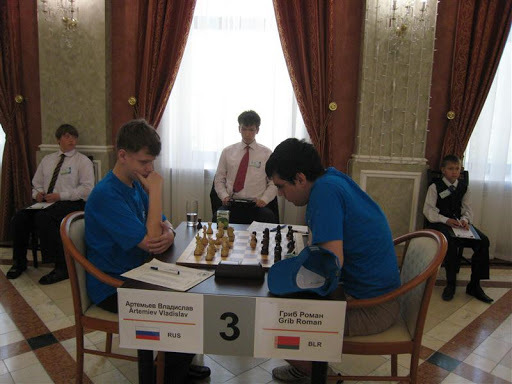 The event also served as a promotion of the European Year for Solidarity between Generations by implementing the Generations Chess Clash into the program. The Polgar Chess Day provided meaningful programs for three generations sharing the same passion, from 4 years old kids to 99 years old chess enthusiasts, to grandchildren, grandparents and parents. Nemeth, Miklos is in clear first with 6/7. Some background from the 2010 event. 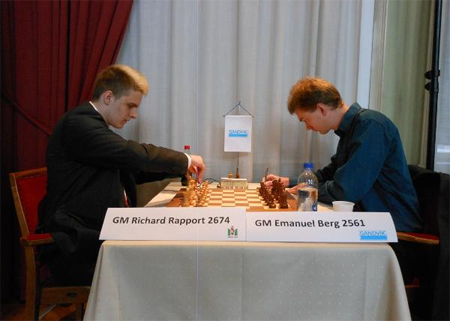 ‘Richard Rapport won the 21st Sigeman & Co tournament in Malmö, Sweden on Tuesday. The 17-year-old Hungarian grandmaster tied for first place with Nils Grandelius and Nigel Short, but won on tiebreak: direct encounter (the results of the players in the same point group). GM Rapport kept the queens on for the maximum tension playing the white side of a g3 Nimzo-Indian. He was finally rewarded for persistence in the sharp QR-QR phase when GM Short loosened his king’s position and allowed a devastating attack. White has a strong attack going. What do you recommend for white now?